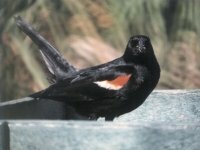 Males are black with bright red shoulder patches. 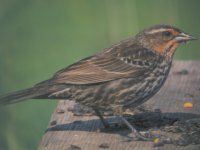 Females and young birds have dusky brown streaks. Range: Breeds from southern Alaska across southern Canada and throughout the United States. Winters in the southern two-thirds of the US. This bird is a common sight along the backroads of Indiana. 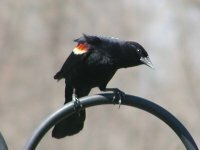 They are very fond of Sunflower seeds and the males can be very agressive to down right nasty at feeders.